Here’s a little twist to your regular Rice Pudding. Just replace sugar with jaggery, and see the magic. So, next time you have your friend over for dinner, you might want to serve them this. They’ll absolutely love it and compliments are bound to flow that night. Measure 1 cup of rice and wash it thoroughly. Then, soak in cold water for 15 minutes. Roughly grind the cardamom seeds and cloves in a mixer or mortar and pestle. Take a big, thick bottomed vessel and heat the milk. When it’s warm, put the rice, bay leaves, cardamom and cloves into it. Keep stirring in low heat for 15 minutes, and make sure you don’t burn the milk. While the rice cooks, grate the jaggery and while you do, keep a close watch on the rice and stir occasionally. When your kheer is about to cook, after about 45 minutes, put the jaggery and give it all a spin. Before serving, add 1 tsp of ghee for taste. The whole process takes time, about an hour at least but the pain is worth. 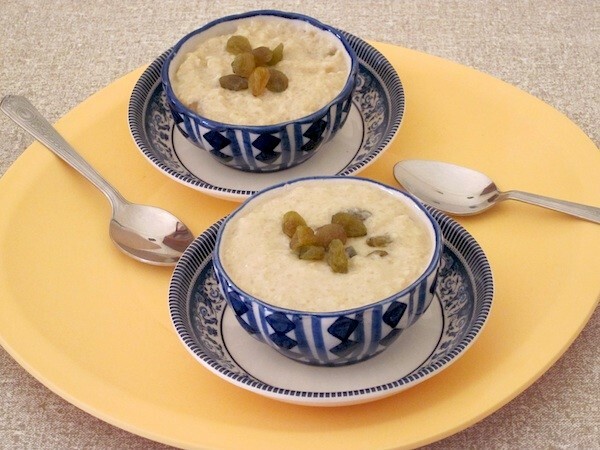 Your jaggery rice pudding will surely be the centre of attraction on your dining table.